Hawaii Preparatory Academy thespians rehearse a number from Pride and Prejudice, a play by Jon Jory based on Jane Austen’s classic novel. WAIMEA, Island of Hawaii— Hawaii Preparatory Academy’s Ka Makani Theatre presents Pride and Prejudice, a play by Jon Jory based on Jane Austen’s classic novel. 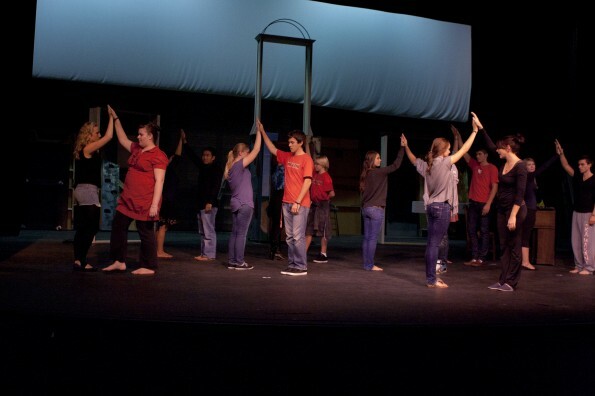 Performances begin at 7 p.m. on February 3, 4, and 5 at the school’s Gates Performing Arts Center. Tickets, which only are available at the door, are $10 for adults and $5 for students. The play is directed by Sheryl Goodspeed, with music by Marina Tichotsky. Set design is by Doug McDowell, lighting design by Jared Terpak, and costumes by Lolly Davis and Sheryl Goodspeed. Pride and Prejudice is a romantic comedy set in early nineteenth-century England, when class, wealth, manners, and society were the governing factors for marriage. Jory’s adaptation blends the words and style of the novel in a theatrical style akin to turning the pages in a book. Molly Mackay-Smith and Logan Martin portray Elizabeth Bennet and Mr. Darcy, a couple who battles their own pride and prejudice, as well as that of society’s to find happiness. The cast features Michael Severino and Gabi Geiger as Mr. and Mrs. Bennet; Kara Erickson, Linnea Gregg, Katie Boehm, and Angie Shumov as the other Bennet daughters, Jane, Mary, Kitty, and Lydia. Other cast members are Michael Monahan as Mr. Bingley, and Julia Varboncouer as his sister, Caroline; John White as Mr. Collins, and Becca Barrett as his wife, Charlotte. Mitchell Parris plays Mr. Wickham; Kyle Matsuda and Delaney Ross are Mr. and Mrs. Gardiner; Alex Disney is Lady Catherine de Bourgh; Churchill Crean is Colonel Fitzwilliam; Jhernie Evangelista is Mr. Darcy’s housekeeper; and Alyssa Evans is Georgiana Darcy.